As mentioned in the comments below, the bug shown here was fixed in a previous release (apparently U1) of the vSphere client. The trick seems to be the bug only existed in the client and unlike previous versions the client does not prompt to be updated along with vSphere and ESXi. I have tested the GA ESXi (build 469512) and vCenter (build 455964) with a U1b client without seeing the bug. This bug has been known for a while and while U1 contained some mentions about fixing it – we now have U1b and the problem still exists. 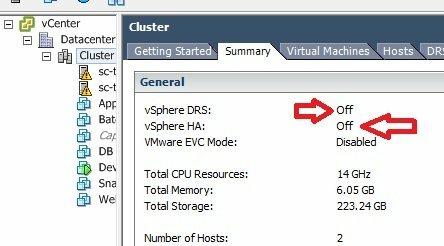 Make sure you have a cluster with HA and/or DRS turned on. Feel free to set any option or enter advanced settings – note that they will all be returned to the defaults. Click Refresh to make sure Storage Profiles are enabled on the cluster. Now return to your cluster summary to verify HA and DRS have been turned off and all settings have been lost. 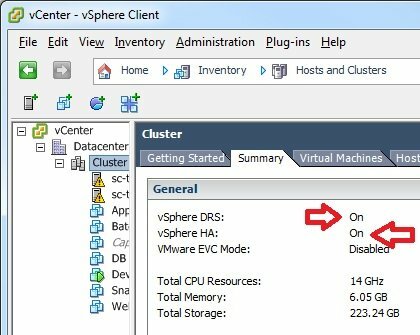 Note that you can now set HA/DRS up with no further issues – assuming you don’t disable/enable VM Storage Profiles which will wipe you out again. Note also that existing FT VMs and Resource Pools will continue to function – but you’ll want to fix HA/DRS if you want to manage those features. This entry was posted in Computing, Storage, Virtualization, VMware and tagged ESXi, troubleshooting, vSphere. Bookmark the permalink. Can you change the title of the post? 5.1 is not yet released, so this should be 5.0U1b I guess. It may lead to confusion. Are you sure you upgraded all components as the KB suggests? if you haven’t this is likely the cause of this issue ! When I get access to my test lab I’ll verify the client status, tho this begs the question – why doesn’t the RTM-version client prompt to upgrade when it connects to a U1/U1a/U1b vCenter or host?